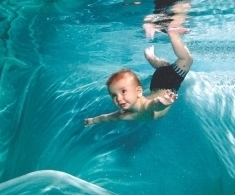 The Aquababies method of teaching was pioneered in Australia during the 1960's. Program deviser, Julie-ann James, was one of the first children that this method was taught to and the first to introduce this technique to the UK. Now one of the country's leading baby swimming experts, Julie-ann has taught thousands of young children to swim. The Aquakiddies/Babies program is the result of her extensive hands on experience and global research during her 25 year career. Our aim is to teach parents/carers the correct method to teach their child to swim. The foundations of the program are based on the reflexes and responses of babies and young children. We aim to provide positive associations with swimming and the lessons are informative, friendly and lots of fun. Stringent health and safety procedures are rigorously followed and all of our teachers are fully qualified holding STA and or ASA certification in addition to our extensive in-house specialist training program. We encourage the early development of baby's natural swimming skills, enhancing their general health, awareness, eating and sleeping patterns and strengthening their cardio-respiratory functions. Our teaching methods are based on persuasive exercises relating to the child's stage of physical and social development. These exercises all aim towards the beginnings of learning to swim. We use gentle submersions if adult and baby are willing. We never ask you to do anything you do not want to. We use submersions as part of the technique to teach breath control, which is a fundamental part of swimming. We teach basic water safety and confidence techniques and use nursery songs in the toddler classes to engage the children and provide positive associations with swimming. However, we are more than simply a splash and fun class - we aim to lay the foundations of future swimming. The classes are structured with a different progressive aim each lesson. There are 3 stages of baby swimming (Stage 1, Stage 2 and Advanced Babies). Each stage is five weeks long, that is, five x 30 minute sessions. Stages may be repeated as progression is matched to the individual needs of each child. We aim to be as flexible as possible, so we only ask you to commit to one stage at a time. During your course you will be asked if you would like to rebook on to the next stage so that we can offer places to new customers. Each five weeks a new block of courses starts at every level. You can return at the next stage of your course whenever and at any venue you choose. Babies remain in Advanced Babies until they are 12/13 months when they go into a Toddler class. There are four stages of the toddler section of the program (Toddlers, Advanced Toddlers, Aquakiddies and Dolphins). The core foundation of our class structure is to teach key elements of learning to swim that relate to children's developmental stages, whilst having fun.